This beautiful headpiece is the easiest way to add a finishing touch to your Belly Dance costume. 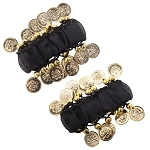 Sequins, ornate edging, beads and coins adorn a flexible plastic headband base which is comfortable to wear for hours. A new classic that is a must-have for every belly dancer's wardrobe! Suitable for all styles of belly dance, for men, women and children. Also great for cosplay, harem / genie costumes, gypsy costumes, Halloween, masquerade, parties, stage productions and more. This is a beautiful piece and I'll use it years to come fits perfect. Bought this headband just for fun. It looks super cute paired with just about anything if you want to add some tribal glamor to your look!! LOVE THIS ONE SO MUCH I GOT ANOTHER IN A DIFFERENT COLOR!